On a visit to the Westmalle Trappist Café, I discovered the beer cocktail on their menu. Tripel with grenadine? This was a surprise at first, but when I thought about the concept—a Berliner Weisse is commonly served with a little woodruff or raspberry syrup—it’s not so strange. 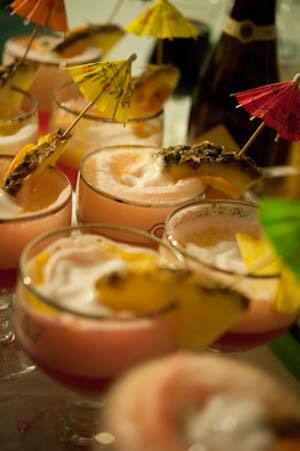 This craft beer cocktails is an easy way to add a little island feel to your luau at home or party, by adding the flavors of guava, coconut, passion fruit with the tripels flavor profile. To make this craft beer cocktail, you’ll first need to make Guava Coconut Foam recipe. A Craft Beer Cocktail, using the flavor characteristics of a Westmalle Tripel and infusing the tropical essence of guava, coconut and ginger, with a touch of grenadine for color. Pour the grenadine into the bottom of the goblet. Tilting the glass, pour the Tripel, leaving behind any sediment. 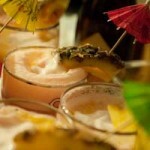 Add the passion fruit juice, and then carefully dispense the guava coconut foam until the goblet is full. Garnish the rim with a slice of orange and an umbrella.